LAMBORGHINI HURÁCAN SPYDER: RAGING BULL! THE QUAIL: CROWN JEWEL OF MONTEREY MADNESS! LAMBORGHINI AVENTADOR SUPERVELOCE: LET THE SUN SHINE IN! With the Goodwood Festival of Speed as a backdrop, Automobili Lamborghini has announced a roadster version of its Aventador LP 750-4 Superveloce. The Aventador Superveloce coupé version made its UK debut at Goodwood Festival of Speed this weekend, on display and running 'up the hill', with Lamborghini President and CEO Stephan Winkelmann in attendance. ‘14 LAMBORGHINI AVENTADOR LP 700: BADASS SUPERCAR! 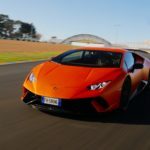 LAMBORGHINI HURACÁN LP 610-4: FIGHTING BULL! LAMBORGHINI GALLARDO LP 570-4 SQUADRA CORSE: DRIVEN!